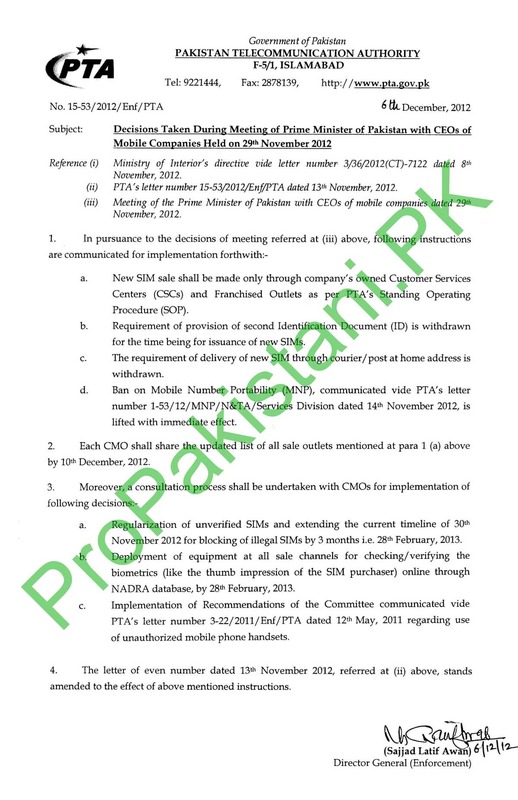 As per directions from Pakistan Telecommunication Authority and advise of Prime Minister of Pakistan, Biometric Verification System for issuance of new SIMs was to be installed before February 28th, 2013, however it appears that deadline will not be met. Deployment of biometric verification system was meant to curb illegal and unregistered SIMs from the market. Moreover, cellular companies were asked to eliminate all unregistered and unverified SIMs by regularizing the unverified SIMs by February 28th, 2013. When the deadline for the deployment of system is ending today, cellular companies and PTA are still arguing over the procedures that are to be adopted for installation of biometric verification system. Cellular companies are more inclined towards the bar-code verification system while PTA is pushing for thumb-impression verification of customers at the time of issuance of new SIMs. Since regulator is technically dysfunctional, it is less likely that such system will be deployed in near future. Meanwhile, a source familiar with industry developments, has told ProPakistani that cellular companies are asking for more time – up to three months – for the deployment of biometric verification solution. Mr. Rehman Malik, the lead character behind all this, is also quite – maybe because he is nearing the end of his service term. Care-taker government is said to be taking charge by mid-March and then the new government. In such situations it is unclear that what will be the fate of biometric verification system. In the end, I would say that cellular operators are just rolling the stones without worrying about unregistered and un-verified SIMs. Same is the case with the government and regulator. This proves that no one was actually interested in curbing the issue of illegal and unregistered SIMs, instead everyone was working on his/her agenda with goals best known to them only.